Installing power points in your home, office or business is a quick and easy job for the electricians at Unified Electrical. Installing an internal or external power point in a strategic place is not only a great way to manage unsightly wiring but also reduces the risk of overloading portable power boards. We have been doing a lot of power point installation in the last few weeks. It seems that everyone wants new sockets installed! There are some really modern power points out there now. Take a look at this one that we installed recently: a double GPO that includes 2 USB power outlets. These new power point sockets are a great way to tidy up messy power packs and cords and they look great too. 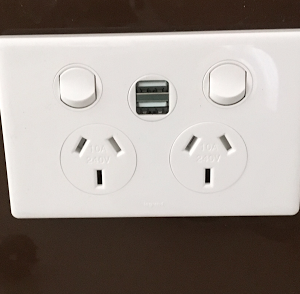 If you need some new internal or external power points installing in your Brisbane home or business give us a call today on 0414 751 299 or contact us online.